We have long been champions of the talent our universities produce and have always been active on the ‘student circuit’. As well as offering Internships, we are patron of Grads in Games and regularly take part in their schedule of events. d3t is currently in a major phase of growth providing us with the ideal opportunity to ramp up our student engagement programme for 2018/9 with Phil Owen, Head of Engineering, taking the lead. Joining the team in July, Phil, an industry veteran with a wealth of experience, knew exactly what he would be looking for in new team members. “d3t is all about discovering and developing talent in order to build and retain a highly skilled team. We look for creativity, enthusiasm and the desire for excellence in all our new recruits and we find those qualities in abundance when we meet students and graduates. “We work on a diverse range of challenging projects, providing a great environment in which to hone skills. And along with our strong culture of mentoring, we offer a rich training ground for those starting out in the industry. 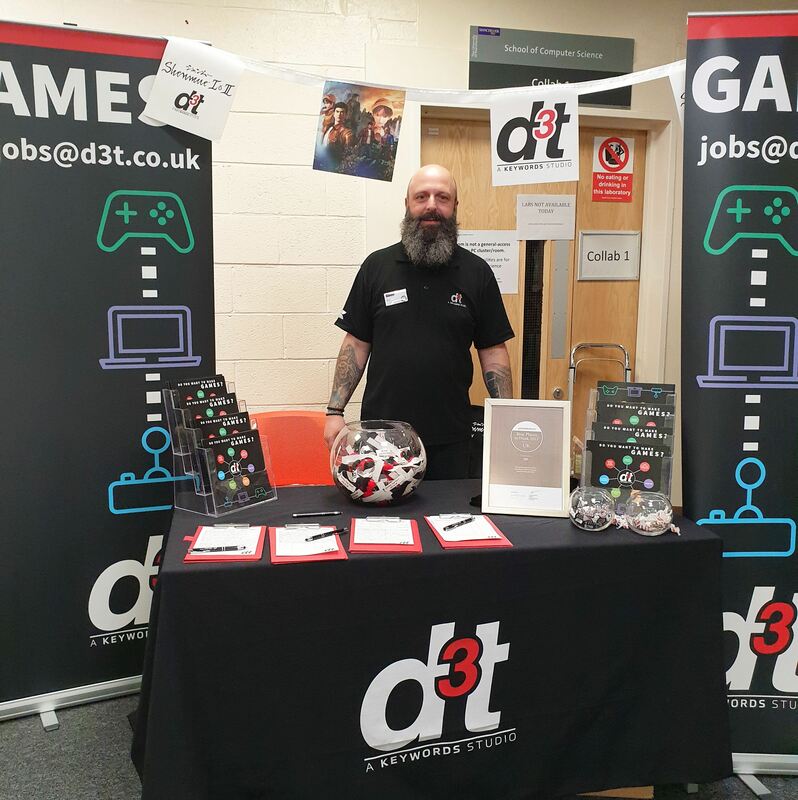 Our first stop was at Manchester University’s Computer Science Jobs Fair, setting the bar for rest of the events. We then visited Abertay, Liverpool John Moore’s, Staffordshire and Nottingham Trent universities. We have been really impressed with all prospective candidates and have met students and graduates from a wide range of disciplines including Computer Science, Maths and Physics. If you are interested in our 2019 Internship Programme it’s not too late to send your CV to jobs@d3t.co.uk. Phil Owen, d3t Head of Engineering, on the recruitment trail at The University of Manchester. Many thanks to everyone who came to see us and to all the organisers who put on such excellent events.